The tone was set when I let my airport pick-up in Palermo know that the entire French rail and transit system was going to be on strike the day I was set to fly to Sicily, and she replied with something along the lines of, “It’s not a trip to Sicily without a little travel chaos.” And boy, was she right. On top of the transit strike, the Paris taxis had decided…heck – why not go on strike, too? But instead of taking a day off, the taxi drivers were planning to instigate “Opération Escargot,” which essentially means driving en mass, as slow as possible, to cause as much disruption as possible. (Whatever happened to fraternité?) In addition to blocking highways and city streets, the taxis were planning to surround the airports, making access difficult, if not impossible. So my perfect partner said he’d drive me to the airport, which required us to leave at 5 A.M. (for my 10 A.M. flight), because any later, and Opération Escargot would be in full-on move-like-a-snail mode. To make a long story short, I made my flight to Rome just fine, but my flight from Rome to Sicily was inexplicably cancelled. And inexplicably, the airline didn’t have a ticket or customer service office inside the airport. 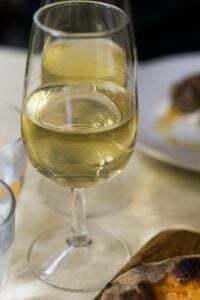 I finally arrived at Case Vecchio, after 16 hours of travel (only 2 ½ hours of that was actually spent going somewhere), where we ate in the darkness of the Sicilian night, drinking sparkling wine, before my head slammed down on the pillow. And I was out of it. Waking up the next morning and poking my head outside the house, I saw Fabrizia Lanza of Case Vecchie, where she runs the Anna Tasca Lanza cooking school, sitting in the courtyard, offering me coffee. After breathing in the fresh air, with the warm sunshine hitting my skin, and realizing that I had escaped the stress of airport (and a whole bunch of other things, too) I almost wanted to cry because I was so happy to be in Sicily, which I sometimes think of as just a whole ‘nother planet. I don’t know what it is about Sicily that I’m so attracted to. There’s a certain savage, forgotten beauty there. It’s Italian, but so different from anywhere else in Italy. And old traditions are still very much alive here, many unaffected by modern times. After downing three well-merited cups of excellent, strong Italian coffee, Fabrizia took us to visit some producers near her house. 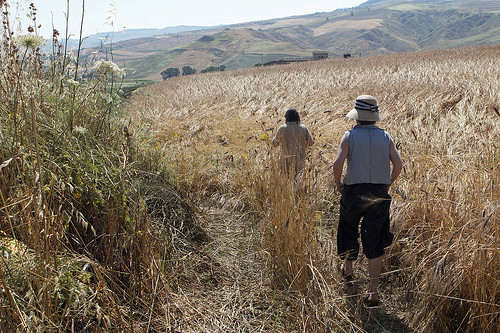 Francesco Di Gèsu took us on a walk through fields of wheat, lentils, and chickpeas. It had just rained, which was probably the last rain for four months, which we slogged through, our shoes encrusted with a remarkably tenacious mixture of damp earth, grass, and hay. 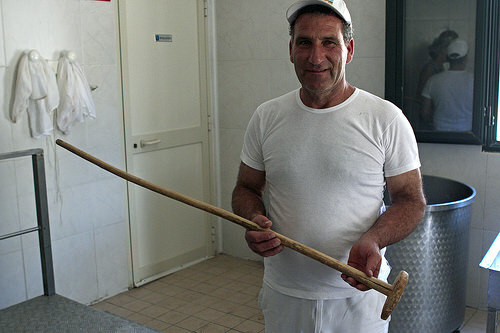 Francesco grows ancient varieties of wheat, which local bread bakers use. So much of what still exists in Sicily are oldways of growing and producing, creating things, bringing products to the local bakery, or salumeria (for meats), for customers. Or locals coming by to pick up orders on their own, the connections going back for generations. 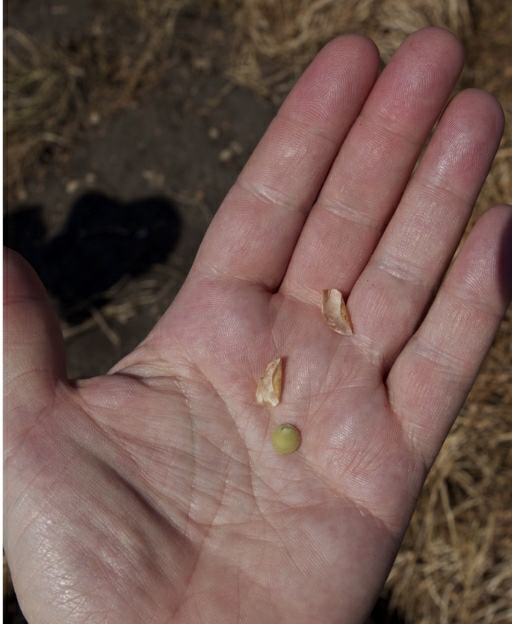 I’ve never seen lentils growing, each little pod yielded just one or two little pulses. Fabrizia told me that they used to dry the branches, hit them with sticks, toss the bundles of dried lentil sticks high in the air with pitchforks, then collect the lentils that fell off. So even though they’ve modernized the techniques a little bit since then, next time you eat lentil soup, or green lentil salad, make sure you eat each and every lentil! 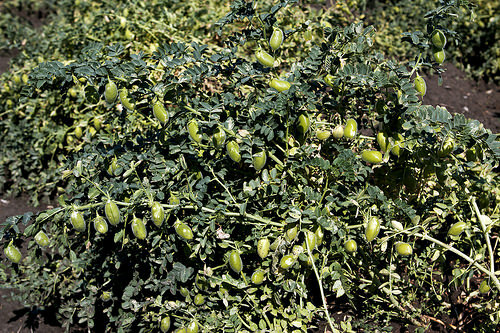 And curiously, I’d only seen green chickpeas (growing, above) on food blogs, whose flavor is a bit reminiscent of peas, and they’re great eaten raw. I would love to bring a bag of these little beauties home to make a summer salad, with tomatoes, fresh oregano, olives, and pecorino cheese. But to be honest, my bag is already full of tomato paste, whole-wheat pasta, Sicilian pottery, chestnut honey, and saffron. Speaking of pecorino, not far from Francesco’s place, where we finished our visit with a jam crostata, fresh almond milk sweetened with grape sugar – and a trip to the shop, to pick up some pasta, made from two kinds of wheat he grows, we pulled up to a sheep farm, to get a closer look at how pecorino and ricotta cheeses are made. When we came in, he was unmolding and turning big plugs of freshly curdled sheeps’ milk, for pecorino, one of the great cheeses of the world. 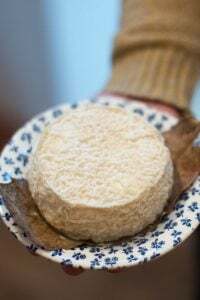 It’s salty and a bit pungent, the sheeps’ milk giving it a slightly tangy flavor, and I often buy it to use as a substitute for Parmesan cheese. It’s also good crumbled into large shards, with a dribble of Italian honey or some fruit. 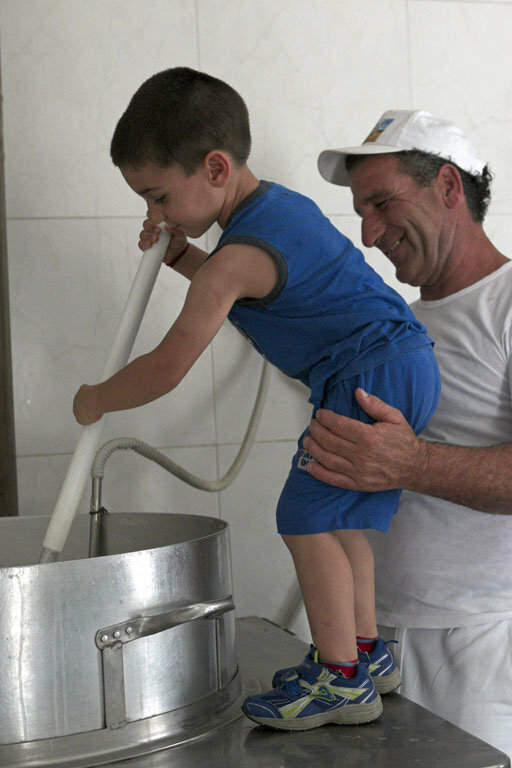 Because nothing is wasted in the Italian countryside, Filippo – who occasionally gets help from his son – cooks the milk over a fire, fueled by leftover olive pits from pressing the olives for oil. I love being in cheese-making facilities; the sweet-smelling warmth of the steam rising off simmering milk, the pristine tile floors, and most of all, watching people practicing one of the most fundamental activities that people do in almost every country around the world, always makes me feel like all is right in the world. And these people are far, far away from things like taxi strikes, airport delays, and social media – they’re just doing all they know how to do, in the best way possible. 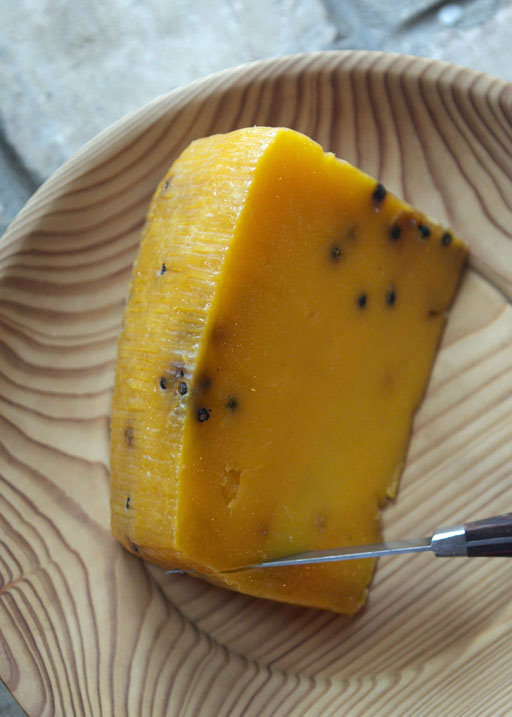 So every time you break into a piece of non-industrial cheese (like the lentils that grow one or two to a pod), it’s good to remember that someone milked the animals, and spent the time going through the lengthy process of turning it into a wedge of delicious cheese. Filippo took us to see the sheep, but me, and his bambino, were more interested in the donkey, who just had a baby the day before. He chuckled and said that he didn’t even know she was pregnant. He walked in, in the morning, and saw a spindly baby donkey, standing next to his (or her) mommy. Getting back to the ricotta, while he waited for the collected whey to reach 75ºC (167ºF), he showed some of his old cheese-making tools, including one particular rod he kept on the wall just above the cauldron. People’s hackles were raised when the FDA in the United States recently announced they were declaring wood unsuitable for cheese-making, and protesters who raised their voices noted that Europeans were much better, and more reasonable, when understanding that time-tested ways of making cheese were better, and safe. But Fabrizia told me a good number of cheese-makers in Sicily had closed down because it was too expensive for them to conform to the EU rules. 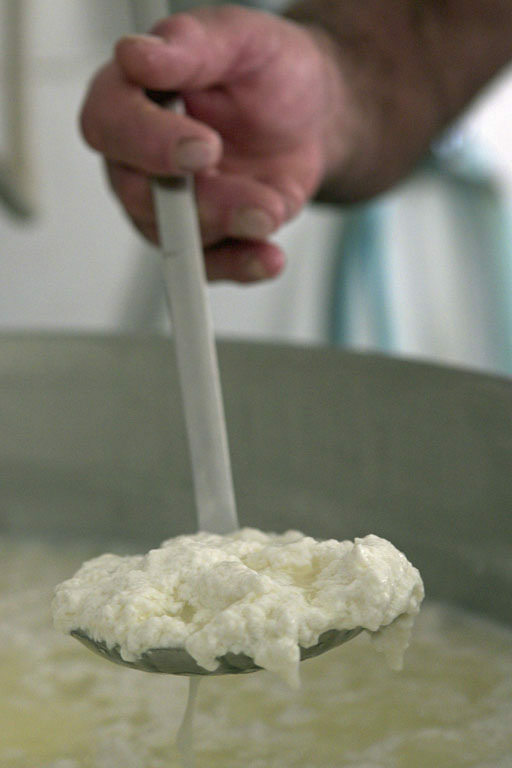 (Sicily is not a wealthy part of Italy and a massive mound of fresh ricotta wholesales for around €2,50 a kilo.) So it’s not just a U.S. issue, but one that is affecting Europe as well, unfortunately. 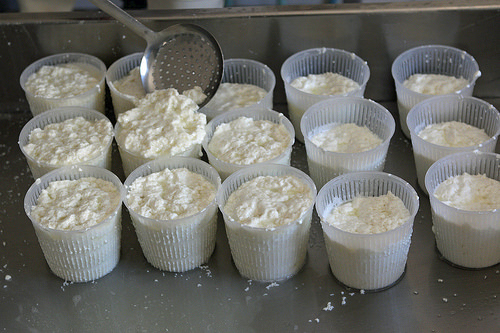 After a lot of stirring, the whey had formed lovely curds, which Filippo ladled into containers. 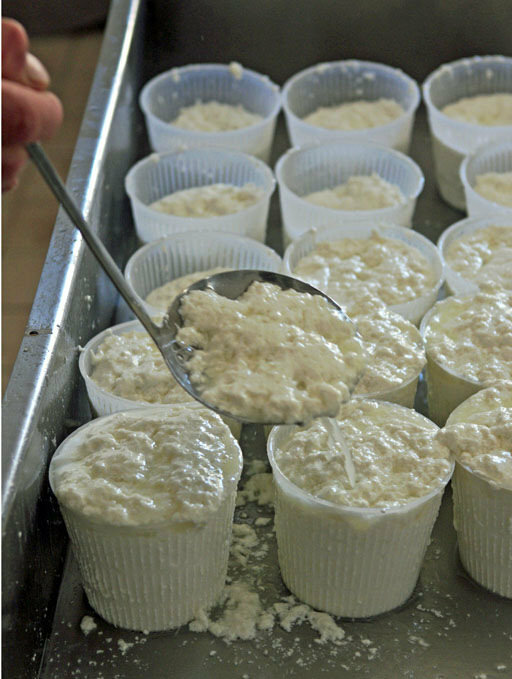 Fabrizia packed up a few massive wheels of pecorino and a couple of tubs of ricotta, to bring home for lunch. And just in case you want to know what cheese-makers and their families eat, cheese seems to make them happy, just as much as it does us. About the travel troubles, I say nothing. That just seems to be the way it is these days. What a great trip! Had never heard of grape sugar, wow. I’ve gotten green chickpeas at our indie health food store and they make amazing fresh hummus – I actually peeled them first to try that and it actually was better tasting then I could have imagined, then for the second batch, left the skins on and I found them much too vegetal tasting. So when lucky enough to come across them again, I will be peeling them. I would think, though, for the salad you describe of garbanzo’s with tomatoes, olives and cheese, they would be perfect unpeeled. Such a great post! Your travel sounds awful, I can imagine you were so relieved when you finally reached your destination. I loved reading about the cheese making! It looks like a lot of fun to visit one of those farms! Have a very nice time in Sicily. Lovely but please tell us about the cake? Tart? At the head of your post! A lovely post. Can you tell me please what grape sugar is? A relative was going to be located at the naval base in Sicily, but instead is now in Naples. 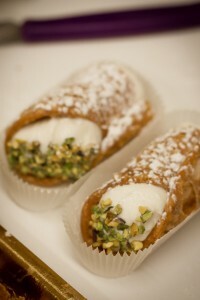 A great reason to visit Sicily but who needs a reason? Great photos David! I absolutely love Sicily – its such a beautiful place! The markets in Palermo are amazing! Thanks for writing this informative and entertaining article about Sicily. It makes me want to visit the place and eat their local food. What is grape sugar? It is sold in the USA? Yes, I will eat each and every lentil on my plate from now on. thanks for all you do. I really appreciate it. I felt I was right there in Sicily with you david, enjoying life, cheese-making, donkey-viewing and meeting the wonderful people with you. Thank you. As for the debacle of French strikes, c’est la vie, n’est-ce pas? When I was there in the late ’60s, I asked my Italian friend — an agronimist who worked at what was then called the Common Market (now the EU) — why the butter sometimes tasted like cheese. He said that the tiny amount of butterfat left in the whey after the cheesemaking process was collected and turned into butter. Talk about not wasting anything! Lovely to read and to see. We were all in your shadow, enjoying vicariously! 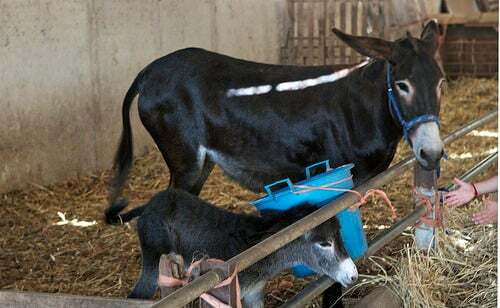 Never seen a baby donkey!! SO CUTE! Thanks. And I know what sorts of cheese I’m picking up at the store this week! Loving Sicily as you do, think you might enjoy reading–if you don’t already– the mysteries written by Andrea Camilleri. In his Inspector Montalbano series the main character is always struggling with the dilemma of what to have for dinner. And what dinners they are! I have such great memories of a two week, early October trip to Sicily. I went with Road Scholar and we visited several farms, had meals with the owners and tasted olive oils. Wonderful time of year to go. Thanks for nudging me back to the memories. Travelled all over, top to heel except Sicily. I must go! Thank you for informative and interesting travel notes. Journeys such as yours may be troublesome but worth it. Thank you for the beautiful pictures and stories about Sicilian artisans and the baby donkey. Your blogs make us feel that we are traveling with you. to visit family; my employer could not approve a 3 week vacation to join them in 2012, but I hope to make it happen next opportunity. Your descriptions and photos sound just like what Mrs. Guarano shares with us! They will Love this post! Beautiful post, David! I had the pleasure of meeting Fabrizia at Boston University last fall. Loved seeing a wonderful film about her project to document Sicilian foodways. Her school looks amazing! P.S. The photo of Filippo and is son is so perfect for Father’s Day!! 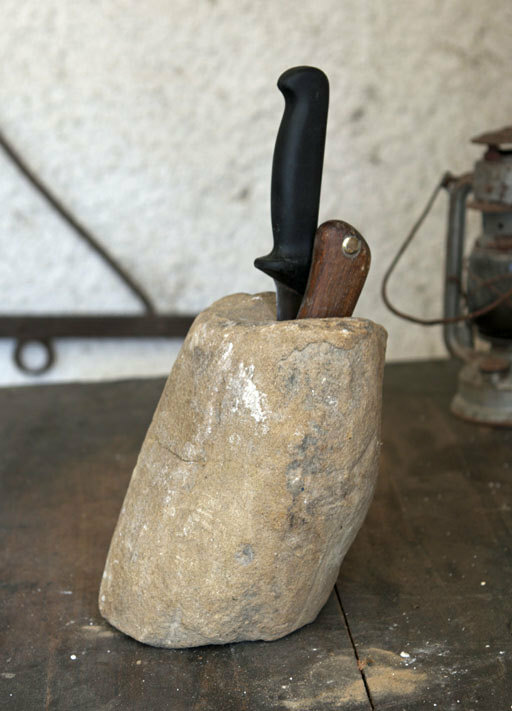 And that knife holder – bellissimo! Think I might have tried for that in my suitcase. Was with Judy Witts Francini with a small group In March for St. Joseph’s Day. We had a demo by a local shepherd of making ricotta. Before our eyes he cooked it and stirred it with a “broom” of wood. Most delicious stuff I ever put in my mouth. Thanks for sharing about Sicily…love it! 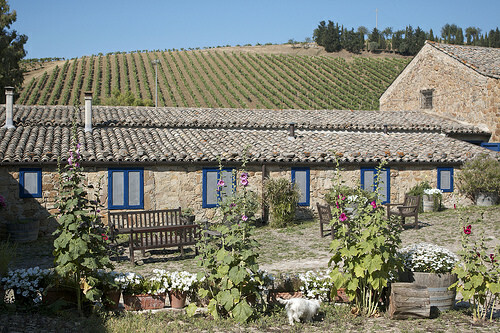 I spent a week there in the ’90s as a guest of the vineyard, Regaleali for the harvest.. The cooking school was closed at that time but tomatoes were sun-drying on all the benches in the courtyard. An unforgettably lush experience. Exactly where I wish I was right now. Thanks for sharing with us! It’s funny that you say to eat each and every lentil because of the labor required to grow then extract the lentils from the plants. I say that about everything I serve to my family because when you think of it, all the good things we eat are labors of love in one way or another :) Someone planted it, tended to it, watered it, harvested it and eventually prepared it to be consumed. Once we take a look behind the curtain, we appreciate it so much more! Your statement was beautiful and so right. We must teach our children and grandchildren to appreciate how fortunate we are to have that grown good available to us. I fear for the foods that are being manufactured and manipulated. Your comment is do appropriate. David we love Sicily too….. and long to return. thank you for a delightful post! Great post and fabulous photos! David – Thank you for the beautiful words and pictures. I love seeing the fresh lentils and chickpeas!! And particularly your call for us to remember the animals and people who make the food we eat possible. So incredibly beautiful. Next you must try Paestum for the mozzarella and the Greek ruins, and you can see the water buffaloes. After all your travel troubles, finally peace and inspiration….thanks David! Wonderful post! It was so nice to see the cheese maker and his family obviously enjoying their lives, and your photos are always excellent! Thanks for letting all of us in on your travels. ah – little donkey, big donkey, the house and land and people. beautiful david. thank you. 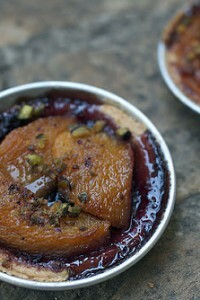 and a little something about that rather glorious looking tart you opened with. and oh yeah….happy trails…..
whoa never heard of grape sugar! also thanks for sharing. it’s almost like i was there! Barbara B–the Bowl still has garbanzos, but not every day. And David, what about that tart at the beginning? My family is Sicilian…so Pecorino (Romano) and ricotta are the two most important cheeses in our Italian-American repertoire, along with mozzarella! My grandparents leased their land for free to farmers around Licodia Eubea…even to this day I believe. I must get there soon. Thanks for the great post! I am new to your blog and so grateful I found it. I really don’t even know how that happened but I am here now. I just love reading what you have written and you are making me feel as if I there ax well. Definitely not the hottie of the traveling but once u arrived in Sicily I found myself transported. I have been to Sicily, enjoyed it much but unfortunately didn’t experience the cheese makng and wheat growing as u have. Thanks for giving it to me now. I have seen the goats and goat cheese made in the countryside and that was a joy as well. I sculpted in a quarry in the southwest of France and if that wasn’t enough to fill my heArt visiting the goats and bringing the fresh cheese back was a real treat. The other was finding out that I could be a total alcoholic on Conyac. (Can’t spell that word and not even drinking at the moment!). I was in Conyac country and couldn’t believe how quickly I adapted! By the way the photographs are fabulous as well. Are you taking them or do you have a photographer along with you? I hope you don’t have to experience a note of the travel hassles as bad as Paris and them the flight business! I look forward to continuing to follow you. Enjoy it all and I will as well except I can only imagine the food whlle I eat my yogurt and oatmeal! Beautiful David, I just love waking up to your blogs. I’ve been to other parts of Italy and loved it, but never to Sicily. It has to be on my next visit to Italy. Thanks for the beautiful photos too! Trip sounds so awful! Welcome to socialist France ! No room for healthy competition, however always good to wake up in Sicily , the land of abundant pleasure! I love this post, David! Very beautiful photos! I would love to get a hold of some Chestnut honey! Lovely. I always look forward to fresh chick peas at my local farmer’s market in NYC. I throw them into vegetable stews or quickly saute them with a little olive oil, garlic and sea salt. They cook quickly, retain their lovely color and have more tooth then their canned cousins . Glad that you enjoyed your trip! I have recently joined your blog David and am enjoying it very much. So informative and humorous. Thankyou. Lovely post. Love seeing other countries via DL . Thank you. My Bella figlia just returned from a food study in Macerata Italy, and is so excited about the Italian pecorinos especially with honey. Interesting about the use of leftover whey. Travel woes… recent trip to Italy, my bag got lost between CDG and Milano. Four days later I was never so glad to see my comfortable shoes. I’ll know better next time. And what is that tart at the top of the page?! Beautiful post… which ultimately takes us to focus on something else – respect! Sicily brings back a lot of nostalgia. Absolutely fascinating read. Thank you, David. I was instantaneously reminded of Van Gogh when I saw the shafts of wheat. The chickpeas created envy. I’ve never seen a fresh one in my entire life. I will have to research their growing requirements. They are wondrous in so many ways. Truly my favorite legume. The cheese!!! The glorious, glorious cheese, what might I add? Nothing. You eloquently revered it’s testimony. I believe my greatest loves of artisan delivery are breads and cheeses. Thanks for all of the great info. I want so badly to make the trip to Sicily. After many adventures in Italy, this is top of my list. And …. I join Philip is asking – what about that tart? Please share. Mmmmm….just like being there! 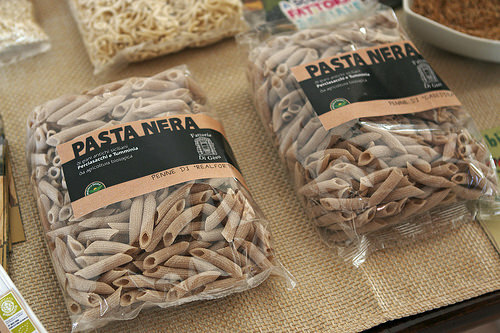 This made me recall in vivid detail a delightful day spent cooking (and eating) in Sicily while on a cruise in 2009. Thank you for embracing the details of your visit for all of us. And yes, what is in that tart? Plus, did you sample any fabulous granita on the island? 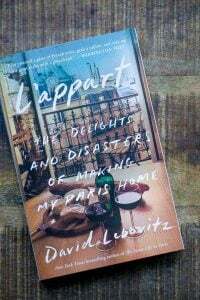 hi David, I wrote about My Paris Kitchen on my blog today, Eye Prefer Paris. Love that photo of the two govt. officials (E.U.) standing next to the big blue bucket. We also have some similar looking govt. officials here in the U.S.. They cannot keep their long noses out of where they don’t belong, either. Great post. My family and I are going to Sicily at the start of August. Staying in Siracusa. Any tips of things to do, see, or most pertinently, eat? I’ve been in Sicily twice,but haven’t discovered the source of original Sicilian potteries that you are referring to.Could you kindly give some valuable addresses for tha kind of thing? Years ago there was in Milan a shop with the arts and crafts from Sicily,but not any more. Pamela, Marji, Christine, Phillip, et al: That is a crostata, a not-moist crusty tart with some jam on top. 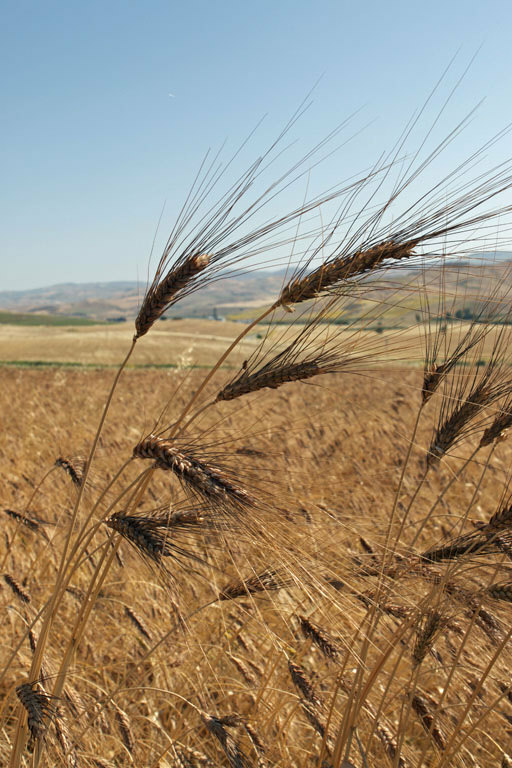 The people who made it grow their own wheat and it had a special flavor from that wheat. The “not moist” quality might not appeal to all palates, but I like it. 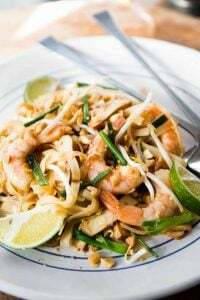 You can likely find recipes on line for them, in English. LWood: Someone recently commented elsewhere that the Rome airport exists to lose luggage. I was so happy to have taken my luggage with me (the joy of traveling light…) since when my flight was inexplicably cancelled, if my luggage had not arrived in Palermo (the airport in Sicily), I was a couple of hours away and it might have been a challenge to get it back – if it ever turned up! Mariann: Yes, that ricotta is magical and special. And you can’t get it anywhere else. Apparently there are a few “rogue” shepherds who are still making it using their old-fashioned tools (and techniques) but you have to know where to find them. Beautiful piece of food writing, David. This is just the type of food writing that I love, which includes travel and cultural experiences that inform your cooking. I have travelled northern and central Italy, but have yet seen southern Italy. It is on my wish list as I read about the food and cooking there. I have also had a few travel nightmares in Italy. I love the country and the people very much, but the Milano airport is a crowded, inefficient pit, and the Italians also have last- minute train strikes . Having said that, I will return again and again! I happen to be 100% half-Sicilian, on my Mother’s side. Great pictures and story. I feel like all these regulations determining what is ‘safe’ for people to eat is ridiculous. Of course we need food to be clean but to make so that everything we eat is pasteurized, preserved and sterile….not much will be left. Not to mention that exposing yourself to small amounts of natural bacteria and weak pathogens strengthens your immune system and causes no harm to you. It’s no wonder this obsession with sterile everything could be related to the rise of allergies and food intolerances we see nowadays. On one hand, people don’t want overregulation. But on the other, if something goes wrong (especially with food hygiene…) people look for someone to blame. When using raw dairy products, people need to be extra careful with hygiene. I’ve been felled a few times with maladies and it’s no fun. I don’t speak Italian but I think Grazi! Bellisimo! and Delicioso! all apply. And good luck to their futbol team in World Cup! 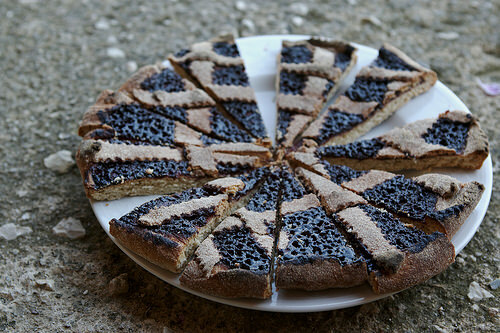 I love the photo of the crostata — it has the quality of a cubist painting about it. 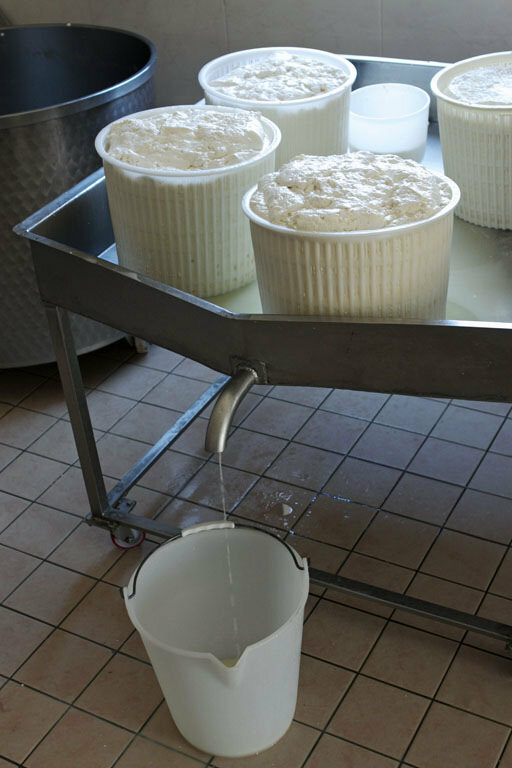 The EU rules on hygiene have been an issue for French cheese makers for a decade or more. Some of them have built conforming facilities, but they still use the old ones when no one’s looking (most of the time), because the cheese doesn’t come out right otherwise. Re Crostata: Thanks– I suspected as much. 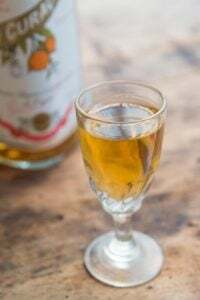 Just the thing to have with a glass of Moscato or Marsala. 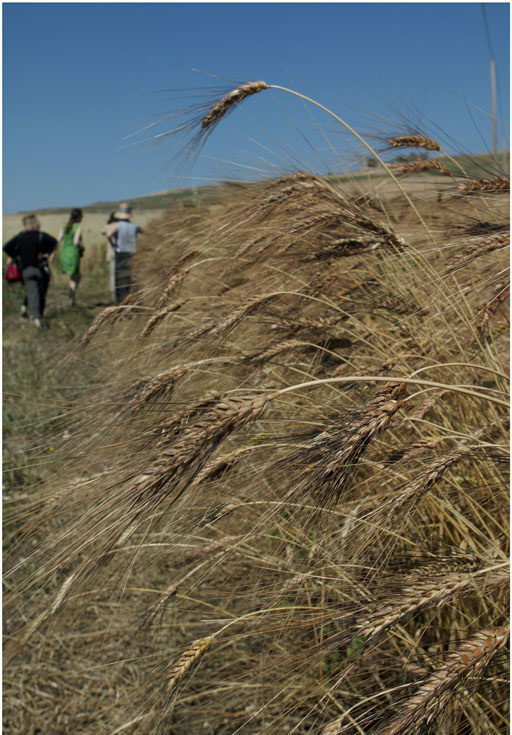 I was at Case Vecchio last April – it looked quite different then with the hills all green and cloaked with wildflowers, but the golden wheat is beautitul, too. And they are correct, I think, about the extra travel challenges – when I went Lufthansa had called a strike, so I had to scramble for new arrangements. But Sicily was SO worth it. Let me know if you need any travel tips (if you are not already back in Paris). I feel your pain re: travel troubles! Grrr… SNCF strike! Can’t wait to hear more about Sicily! I’ve never been and it’s high on my list! Your title to this post says it all, David. Once you have been to Sicily, there always has to be another again, because it steals ones heart. I am wondering what effect the recent eruption of Mount Etna has had on travel within Sicily. I know it is on the other side of the island from where you are, but what are you hearing about it? Probably one of my favorite posts because I’m completely enamored with pecorino cheese and homemade ricotta. It’s amazing that the cheese maker wakes up that early everyday and works so hard (500 sheep? Sheesh!). But the cheese he makes is beautiful. I too often sub pecorino for parm – it’s much tastier! And nothing’s better than a slab of homemade ricotta on a slice of baguette with a drizzle of honey. Love! Also, I’m sorry you had such a bad traveling experience getting to your destination. Nothing is worse than being stuck at the airport! wonderful post, felt like I was right there with you, from the travel woes to the steamy warm beauty of the cheese crafting….sounds like a dreamy time…. I wish there was a way to “waiver” concerns about wood tools and traditional methods in the creation of food. I click “terms and conditions” boxes every day for information safety issues and would MORE than gladly click a similar box to buy cheese made by Filippo and his wooden cheese stick. I don’t think I’m alone in that… fingers crossed for a solution before all these tools and methods are scattered to the four winds. 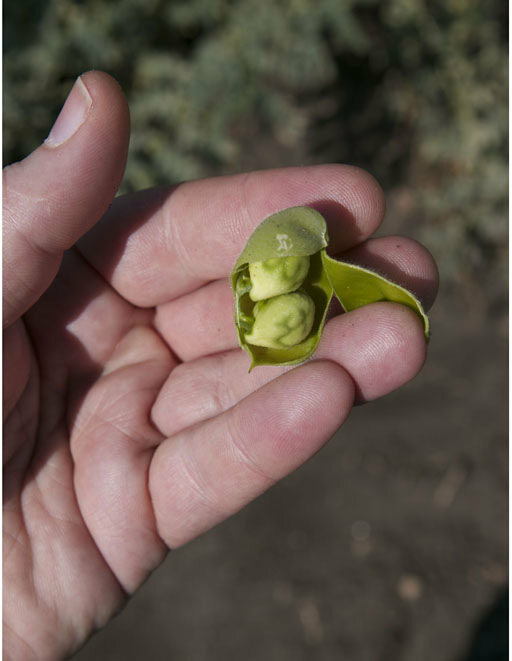 Li-hsia Wang – Thanks for the info about garbanzos at the Bowl. I got them at the original Bowl before the new one was built – and the new one is two blocks from my house, so I haven’t been to the old Bowl since the new one opened. I haven’t seen garbanzos at the new Bowl – could be just missing them, but it’s possible they are one of the things that is not found at both stores. Given the three-minute walk, we go pretty often! The day before your blog, I was with friends in Mardin Turkey, buying soft salty cheese. The shop owner was nibbling small pods from a shabby branch; when I expressed interest he gave us some to taste. Bright green, crunchy, slightly pea tasting. That evening in Diyarbakir, our guide bought some Lon a market tour and identified them as green chickpeas. Delicious. Our only question: where to find them in Sydney Australia. And David, the food in East turkey is beyond wonderful. Often you can find soft cheeses at Arab markets and stores. Feta is another cheese that lends itself to snacking. 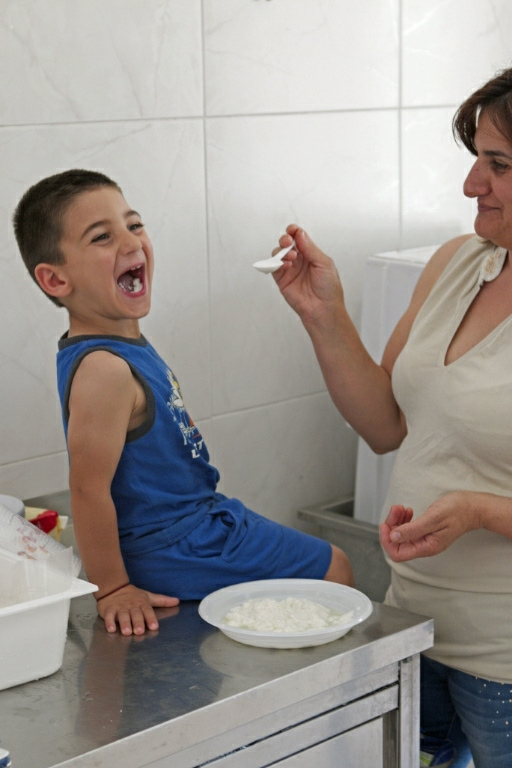 You can also make your own by making labneh, which is super-simply, letting it drain well. 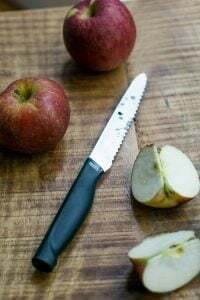 David, I adored this post… the writing is excellent, the photos are so gorgeous… it made me want to drop what I’m doing and go immediately to Sicily for lentils and sparkling wine and whole wheat pasta tossed with that fresh cheese, and to pat that baby donkey! I shared this one with my mother, and she loved it too. Ah, yes, the FDA. They’ve backed off their “no aging on wood”, at least here in Vermont. Them there are fightin’ words, they soon found out. Lovely photos. Just returned from our second trip to Sicily and completely share your sentiments. It just grips you, and not for entirely rational reasons – but of course we are trying to figure when the next visit will be. And If my friend who lives there part-time can work with some Sicilian nonnas to reverse-engineer the pistachio arancini we had in Bronte, I’ll be happy for the rest of my life. David, this was absolutely wonderful. Thank you!!! Your beautiful post made me take a deep breath and smile. Thank you! I’ve been enjoying your posts on Sicily. My grandparents came from Piana degli Albanese. I was fortunate to visit family there in 2000 and am looking forward to going back and exploring more of the island. I love Anna Tasca Lanza’s cookbooks. They remind me of my nonna’s cooking. Grazie! As you have experienced there’s no need to go to Sicily for strikes…. I was one suffering from ‘our’ SNCF strike and took a whole roundtrip with several changes when I was meant to return to Paris on a direct TGV…. plus I got into the heavy rain/hailstorm when finally making it to my home train station…. there was no joy! But as usual you made me yearn for Italy/Sicily with another wonderful post which I can only enjoy now, days/weeks later… Thank you so very much – you’re truly an outstanding ‘everything’: great personality, writer, cook, blogger, photographer. I LOVE how you point to the finer things of our daily food-life by subtly pointing out that we never must take anything for granted. The lentils are a BEAUTIFUL example; something so basic and looked down at (see the bible for that!) and yet – what care and work goes in a plate of lentils – same thing with many other foodstuff. As a Swiss woman I know a bit about cheeses and I’m forever in awe of the labour and true love our cheese-makers are putting into their work; the taste of an incomparable product is their and our reward. Thanks for your travel post yet again. Always love your insights and I love visiting artisans and factory type settings, too. It gives me a great perspective on the the time honored traditions and the things we take for granted living in large cities. Hermoso David… Gracias por compartir tus maravillosos viajes. At present, it is only compatible with the iPhone but we have developers working on an Android version for the future. You can find your when it’s released at the Paris Pastry Facebook page. You can download it as an e-book on almost any device, including Android devices. 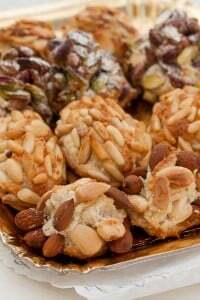 More information is at the Paris-Pastry app page. Looking for pickled pepper recipe and I found you. 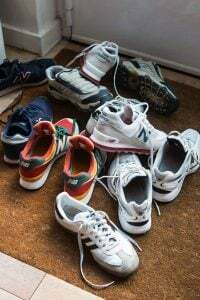 Loved your story about grandma and her history, so endearing… laughed at the collection of shoes, my ancestors also saved everything, and loved their whiskey. There is nothing new under the sun. Ive never been a tweeter until now but your story drew me to tweet you, just a loving guy you are… cheers. I reside in north Florida, and love the warmth, having lived in beautiful rural Wisconsin where we organic farmed grain and such, beef and poultry, where my spouse and I raised our 3 children.Long Winters and summers like a flash of light, was the killer of that life style, and we became weary and sold our beautiful 120 acre farm to an Amish family, who are farming it like God intended. The Scandinavians settled there in this area of south west Wisconsin, and saw promise in the farm land, mini fjords and many lakes. They weren’t too keen on Amish moving into this area, but we being the open minded people we were, learned from and welcomed our Amish friends and were thrilled we were selling to folks that wouldn’t partition the property and sell off to develop.